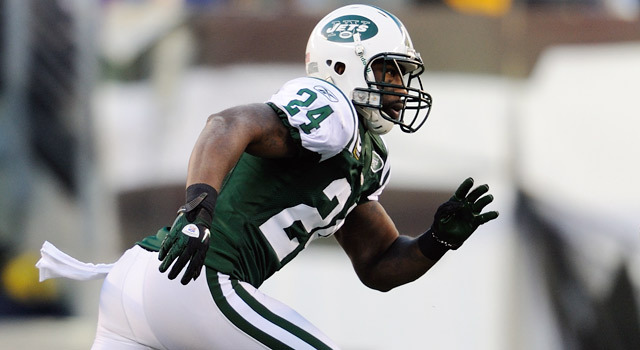 Darrelle Revis completely shuts down one side of the field, making him the game's most dominant defensive back. Former NFL scout Daniel Jeremiah is getting into the Olympic mindset early this summer, handing out NFL Podium Awards for the top three players at each position group. Remember, this list is based on where these players are ranked heading into the 2012 season. Today, he takes on defensive backs. Daniel Jeremiah gets into the Olympic mindset and recognizes the top three players at each position. The NFL has a lot of up-and-coming talent at both the cornerback and safety positions. Several of those young players have already earned Pro Bowl honors and posted impressive statistics. However, the players that made this list are on a totally different level. Of the three players who made the podium in this category, two are sure-fire, first-ballot Hall of Famers, and the third is well on his way to joining them. Speaking with several different coaches and front-office executives, I found 100 percent agreement on Revis' status as the top defensive back in the NFL. Revis, who finished the 2011 season with four interceptions and 25 pass breakups, can completely neutralize his assigned wide receiver, allowing the Jets to get extremely creative with their coverage and blitz packages. He is just 26 years old and should continue to hold the top spot at his position for years to come. "He's the most versatile defender in the NFL." That's what the general manager of an opposing NFC team said when asked about Woodson's value. The Packers use him in a multitude of roles. He can cover outside or inside. He has the speed and fluidity to match up with top-end receivers, while also possessing the size and strength to mirror tight ends down the field. He is an outstanding tackler, and his timing as a blitzer is the best in the league. At age 35, his production continues to impress. In 2011, he tied for the league lead in interceptions with seven. There are several young secondary players on the cusp of great things, but this final spot came down to the top two safeties of the last decade: Troy Polamalu, of the Pittsburgh Steelers, and Reed. Polamalu had a better season than Reed last year, but I'm sticking with the Ravens safety. Despite a dip in production after setting the bar at the position in 2011, Reed still has the most interceptions in the league over the past two seasons, with 11. Before their meeting in the AFC title game in January, New England Patriots coach Bill Belichick said Reed was the best defensive back he's ever coached against. I spoke with one of the most respected defensive coordinators in the NFL, and he still believes Reed is the top player at his position. Others considered: Troy Polamalu, SS, Pittsburgh Steelers; Johnathan Joseph, CB, Houston Texans; Lardarius Webb, CB, Baltimore Ravens; Earl Thomas, FS, Seattle Seahawks; Eric Berry, SS, Kansas City Chiefs; Dashon Goldson, FS, San Francisco 49ers; Eric Weddle, FS, San Diego Chargers; Joe Haden, CB, Cleveland Browns.